What is the difference between MedLion Clinic's Virtual Primary Care and Telemedicine? Are you able to establish 1:1 doctor-patient relationship using Telemedicine? Is the Telemedicine doctor dedicated to serving you and your family? Are you and your family able to see the same Telemedicine doctor every time? Are you able to communicate 24x7 via text messaging with the Telemedicine doctor? Is the Telemedicine doctor able to provide acute, preventive and chronic condition care? Is the Telemedicine doctor able to write orders for labs/tests and do follow up consultations to review results and provide appropriate treatment? Is the Telemedicine doctor able to make a referral to a Specialist when necessary and share medical records? Is the Telemedicine doctor able to treat your children free of charge? How many health conditions can the Telemedicine doctor treat you for? Is the Telemedicine doctor able to provide you unlimited care for an affordable monthly subscription fee? 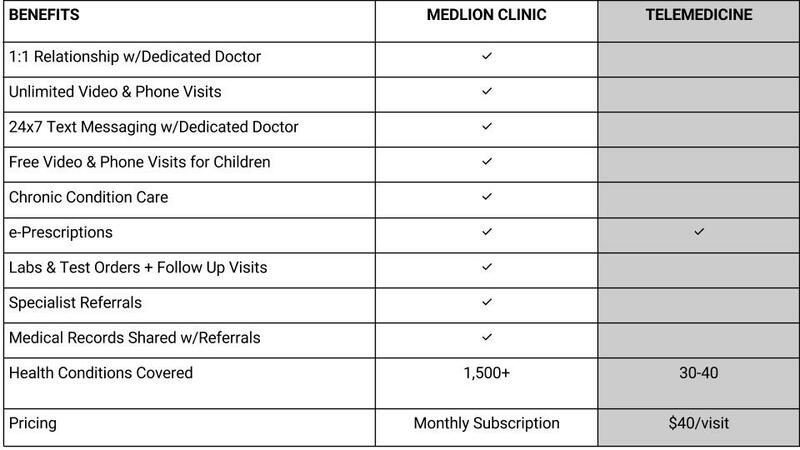 MedLion Clinic is able to do a lot more for you because we are a Virtual Primary Care provider. A primary care doctor is a specialist in Family Medicine or Internal Medicine who provides care to the patient and takes continuing responsibility for facilitating the patient's comprehensive care. MedLion Clinic's primary care doctors are specifically trained to provide comprehensive primary care services through residency or fellowship training in acute and chronic care settings. MedLion Clinic's scope of primary care includes health promotion, disease prevention, health maintenance, counseling, patient education, diagnosis and treatment of acute and chronic illnesses. MedLion Clinic's primary care doctors are devoted to providing services to a defined group of members with 1:1 relationship and they serve as the advocates for the patient in coordinating the use of the entire health care system to benefit the patient. MedLion Clinic membership offers unlimited video and phone consultations with dedicated, high-quality, board-certified doctors at a price point that is unmatched.